You need to know what the site looked like in the past, right? Doug's training on SPAM checking domains has been invaluable to me. Not only for the sake of the PBN HQ Marketplace staying clean and SPAM free, but also in giving me knowledge in what to look for in my own site building on expired domains…PBN or not. Step 1: Enter a domain that you want to see historical snapshots of. In this case, we're using prosafaricenter.com. Enter the domain, and hit submit. Step 2: Easy as it comes. Once you hit the “submit” button, you'll your domain listed in the box below as “pending”. 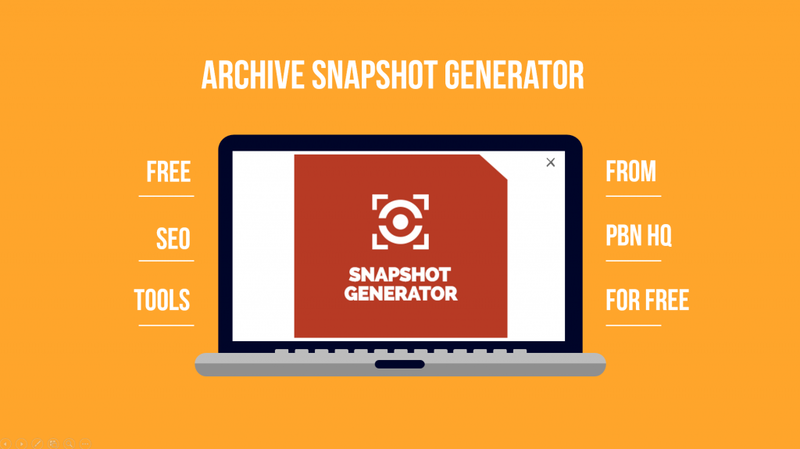 Now, the Snapshot Generator takes a little longer to run than the Wayback Downloader or the Availability Checker, but we're talking only several seconds…not minutes. You'll notice that your submitted domains have three statuses: “Pending” (the PBN HQ Magic is working), “Finished” with an option to “View” (the Magic is done and you can view the Snapshots when you'd like), and “Checked” with an option to “View” (Our Magic is done and your checking has been done). Step 3: When you click on “View” for any Finished or Checked domain, you'll be brought to a screen that will allow you to “View Snapshots” of your checked domains. Step 4: Is the final look, and what you've been waiting for. A lineup of historical screen shots of the domain that you're checking. As you can see from our example, prosafaricenter.com was a dive center and equipment site at one time. You can also see that Archive.org doesn't have some snapshots of the site and there is are 301 re-directs also. This is vital intel for you to know whether you would or wouldn't build a PBN site on this domain. Our metrics were good. The site wasn't spammed. But those 301s are an issue, in my opinion. This the kind of intel and ammo that PBN HQ gives you for free when building your PBN sites or even money sites. You're welcome. Wait until you see Part 3 of this series when we introduce the WayBack Downloader. It's a home run.